This mop uses millions of microscopic fibers to grab and hold dirt, dust, hair and moisture. <br />This mop can be used dry for a sweeping effect or damp for a deeper clean. <br />Pick up dirt, dust and hair with ease using this innovative mop specifically designed for hardwood floor cleaning. The microfiber mop head lets you clean effectively without chemicals, while the scrubbing strips provide a deeper clean when damp. This mop uses millions of microscopic fibers to grab and hold dirt, dust, hair and moisture. This mop can be used dry for a sweeping effect or damp for a deeper clean. Pick up dirt, dust and hair with ease using this innovative mop specifically designed for hardwood floor cleaning. The microfiber mop head lets you clean effectively without chemicals, while the scrubbing strips provide a deeper clean when damp. Machine Washable up to 100 Times! Microfiber Grabs Dirt and Washes Clean! Instructions: Use & Care: Use Dry—Attracts and holds dirt, dust and hair for a thorough clean. Use Damp—Cleans effectively without chemicals—just use water for a deep clean. This is my go to cleaning tool right now! There are several things I love about this. First of all, I know that you CAN use it to clean on a dry floor or with water but I prefer to use it wet versus dry. The packaging says all you need is water; and they are correct. However, I have diluted my favorite cleaner with water and use a spray bottle to spray that on the floor to use it. There is a material in the pad that acts as scrubbing agent. (See picture.) I would compare that material to that of the scrubbers on a sponge. At first I wondered why put those on versus a fluffy pad or one with the same material throughout. (Like my steam cleaner.) Boy does that material make a difference. When used with my cleaning solution I can get any stickiness off of my floor. I absolutely love that. I also love that I can just throw the pad in the washer when I am finished to clean it. My final “love” about this is also somewhat of a “hate”. I love that it is big because it helps me clean my hardwood floors extremely quick. However, I don't like that it's so big because its hard to use in smaller areas like in the bathroom or in my washroom. I do like that it's easy to store, despite its size. You just fold the bottom half up and it will store in any small area such as between a counter and a refrigerator. Overall, I am loving this and would recommend it highly. This is a good mop I have tried so far. The cleaning surface on mop is approx 15inch length & 8.5 inch wide. The handle is well made plastic & can be kept straight on floor with a place behind mop surface to snap it on for storing or can be kept upright in a corner space. 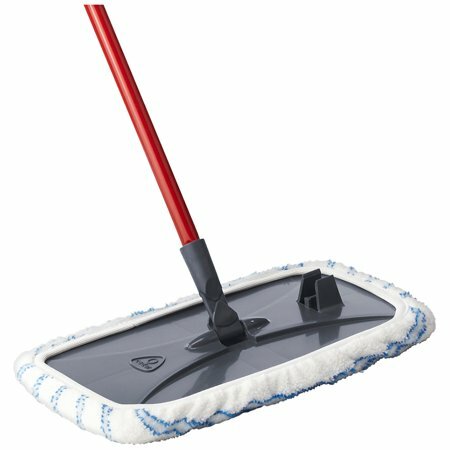 It is a breeze to clean a larger area with this mop as the surface head is big & the handle moves very smoothly. I have used it couple of times in a week & I like it. The mop cloth is made of microfiber & I have used it on damp floor with water & all purpose cleaner as well. Firstly, my floor is not very dirty or sticky by any means so using this cleaned my floor very well & I could also see all the hair stick to it when i finished cleaning too. I washed the mop & it still stands in good shape. Only thing to be careful while using water for cleaning is as it is microfiber the water is not fully absorbed & I used fan for fast drying of the floor. I read online that the refill mops are available, I haven't needed it yet. Looks like the mop can be used for longer time as it holds up good after washing. I used on my vinyl floor, hardwood area & tile area. Everything cleaned excellent. 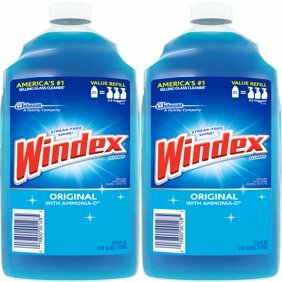 I would recommend this as great value for price for anyone who has larger hardwood floor area or vinyl area as well for cleaning. It is also excellent for office floor use. This is a great tool for cleaning hardwood floors. The mop head is thick and ample sized, and easy to clean and use. It is on a swivel head making it easy to manipulate around furniture and walls. I used it as a wet mop with clear water and no cleaning solutions. The dirt that the mop picked up with only water was amazing. All I had to do was rinse out the mop after I used it and it is ready for the next time. This is a great product to have handy to keep my hardwood floors clean. O-Cedar Hardwood Floor 'N More Mop is made of millions of microscopic fibers that grab and hold dirt, dust and moisture. It cleans effectively without chemicals--just use water. That is the description from the sales promo for the O-Cedar Floor N Moore Mop. And it is. I love a clean house and I have animals so you know that fur, pet food pieces, water dishes all can be a bit much. This is my answer. I can sweep the floor, clean around the pet dishes and right into the laundry, not skipping a beat. It is a marvelous item, approx. 13 inch wide and 18 inches long, big enough for the large areas, small and swiveling for the smaller areas. This is one of those great buys, now I don't have to keep buying throw-a-way paper mop tops and throw away that money. The O Cedar Microfiber Hardwood Floor ‘N More Damp/Dry All Surface Mop is great for cleaning my wood floors. I am used to using a self-wringing twist mop (with buckets of water with floor cleaner) and although it does a good job of cleaning the job is so tedious that I tend to put it off much too much! And when I do get around to it, even with the best wringing job the floors are left extremely wet and so take forever to dry. With this mop I can quickly and efficiently clean the floors with only the water dampened pad. (I vacuum 1st to remove the majority of dog hair, then take the microfiber cover off, soak under faucet, wring out and reattach) When it becomes soiled, I take off,rinse under running water, wring and reattach (which is quick and easy) and continue. I find this mop much easier to deal with for maintaining the wood floors. And it is machine washable! I would still use the twist mop and floor cleaner water for heavy duty cleaning every so often, but for weekly maintenance this mop is wonderful. I have probably passed by this mop in the stores without paying any attention before. You get so accustomed to doing things a certain way, even when its difficult- simply out of habit. I plan to pay more attention when picking up my usual items at Walmart from now on!